The UK’s missions around the world have run a wide range of activities to mark the big day and explain why modern Britain is such a creative, open, connected and dynamic country to live, work and visit. Events ranged from receptions, street parties and live screenings to web chats, quizzes and competitions. The British Embassy in Beijing has partnered with Sina - the biggest online web portal in China - to promote the wedding and modern British values, and offer Chinese netizens a fantastic online experience. The British Embassy in Harare asked the public what they would do if they were King for a day, Brunei threw a street party and the British Embassy in Kuwait ran a competition with the theme ‘A contemporary Royal Wedding. The British Embassy in Vietnam held a number of activities to celebrate the special event, including meeting students, a children’s painting programme and a reception hosted by the Ambassador to British community in Hanoi on 29 April. The British Embassy in Israel held a double celebration for the Royal Wedding and the Queen’s Birthday, while High Commissioner to Pakistan Adam Thomson gave a message to commemorate both events. Sri Lanka organised a Facebook photo competition around “Sri Lanka-Britain partnerships today”, while the consulate in New York teamed up with the Paley Center for media. Reflecting the fact that this is a Royal Wedding of the digital age, Heads of Mission gave their views on the big day through a range of media. In a video message, British High Commissioner to New Zealand Vicki Treadell shared her thoughts on the events of this week, while Ambassador Judith Macgregor in Mexico participated in a webchat with one of Mexico’s largest national newspapers. Ambassador to the United States Nigel Sheinwald wrote “Britain and America: A Marriage of True Minds” to commemorate the day, and New Yorkers congratulated the Royal Couple in a video message featuring Sir Alan Collins, Consul-General, Ray Kelly, Commissioner of the New York Police Department, Michael Johnson, US Olympian, visitors to Times Square and Marty Markowitz, Brooklyn Borough President. Foreign Office bloggers also marked the day and discussed what it means for modern Britain. Ambassador to La Paz Nigel Baker talked about tradition and modernity in his latest piece, while in Sofia Charge d’affaires Catherine Barber praised Britain’s ability to combine the old and the new, highlighting that this is “the first royal wedding of the truly digital era”. In Madrid, Ambassador Giles Paxman wrote that the Royal Wedding “says a lot about the kind of society Britain has become”, and is “as much about celebrating Britain today as it is about respecting Britain of the past”. In the Republic of Korea, Ambassador Martin Uden produced a series of blogs about the Royal Wedding, looking at what significance the event has in the UK and in Korea, as well as what happened in Seoul to celebrate on the day. Ambassador to Romania Martin Harris talked about getting married as a time of joy, while Pablo Retamal in Santiago gave some tips on having a green celebration. Ambassador to Sudan Nicholas Kay gave the view from Khartoum, and Ambassador to the Netherlands Paul Arkwright discussed the strong ties between the British and Dutch Royal Families. Meanwhile, the Foreign Office has been working closely with Clarence House and Buckingham Palace to support all the official Royal Wedding coverage, including the Royal Wedding video message book and official Twitter hashtag #rw2011, which is being used to collect tweets of celebration for the Royal Couple. On Facebook, UK embassies, high commissions and consulates have been promoting the Royal Wedding Stories feature, enabling people from all over the world to share stories and well wishes. 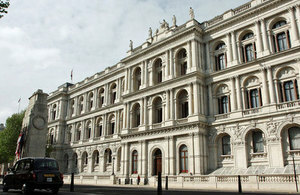 Find out more about out more about the Foreign Office on the web.